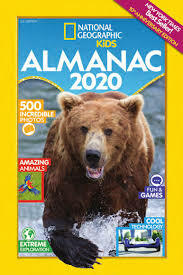 This May, National Geographic Kids releases the 10th edition of its New York Times best-selling almanac for kids: National Geographic KidsAlmanac 2020 (May 7, 2019; ISBN: 9781426332814); Paperback $14.99; Ages 8-12; 352 pages), hailed by School Library Journal as “one of the leaders in the world of almanacs.” This year’s almanac features all-new content, interviews with renowned National Geographic explorers in each chapter, a special look at what was going on in the world when the first National Geographic Kids Almanac came out 10 years ago, plus the results of the 2019 Almanac Challenge — Lions Forever Poster Contest — and a new challenge for kids who want to get involved with helping our planet. The National Geographic Kids Almanac is designed to inspire young readers to be the change they want to see in the world around them, encouraging them to become more involved environmentally, socially and in other ways. In this year’s edition, National Geographic Kids launches the 20/20 Visionary Challenge, asking readers to imagine the world 10 years from now and to picture a positive change, invention or discovery they’d like to see become reality, in whatever area interests them: animals, people, places, science, technology or beyond — the sky’s the limit! Kids will be able to read some of their great ideas in next year’s Almanac 2021. Inspiration and information on how to submit 20/20 Visionary Challengeentries, as well as other digital extras, can be found at natgeokids.com/almanac. In May, National Geographic Kids Almanac 2020 is hitting the road with the National Geographic Kids Amazing Awesome Almanac Game Show, an interactive, multimedia traveling quiz show based on the all-new 2020 edition. “We wanted to celebrate the 10th anniversary of the almanac in a unique and exciting way, which led to the creation of the Amazing Awesome Almanac Game Show. We can’t wait to bring learning to life for kids around the country on the national tour,” said Rebecca Baines, VP and editorial director of National Geographic Kids Books. Tour cities include Washington, D.C., Philadelphia, Boston and the northern New Jersey metro area. National Geographic Kids inspires young adventurers to explore the world through award-winning magazines, books, website, apps, games, toys, television series and events and is the only kids brand with a world-class scientific organization at its core. National Geographic Kids (10 issues per year) and Little Kids (6 issues per year) are photo-driven publications that are available on newsstands or by subscription in print and on tablets. The award-winning website kids.nationalgeographic.com excites kids about the planet through games, videos, contests, photos, quizzes and blogs about cultures, animals and destinations. National Geographic Kids Books publishes as many as 100 nonfiction titles each year and teaches the youngest readers why the world is a weird, fascinating and fun place. National Geographic Kids Entertainment brings the renowned National Geographic brand to quality animated and live-action, entertainment-driven television, home video and online programming.